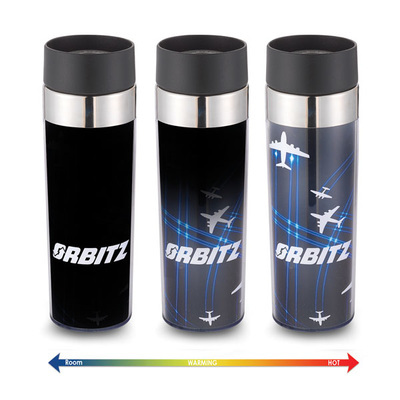 ​Do you know anyone that doesn't have a travel beverage container these days? I don't! America is always on the move and most people grab a drink before they walk out the door.... this is why you should have a customized tumbler. Whether people take their tumbler to the gym, their office, the beach, wherever - why not be everywhere the people are? 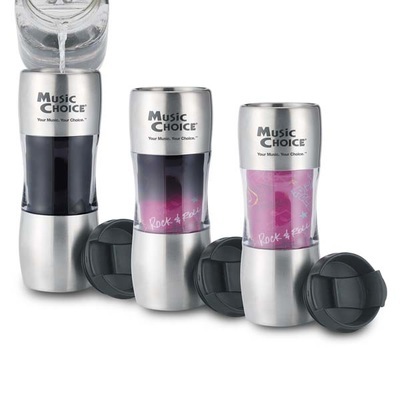 Now, with so many tumbler choices, how do you choose? 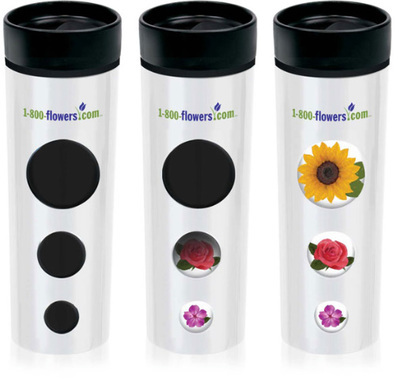 We here at Ad Specialty Products suggest tumblers that range from 12oz - 16oz in size. We also recommend those that are double wall lined and have a spill proof top. The tumblers highlighted below should be able to suit any business needs. Take the Santana 12 oz. 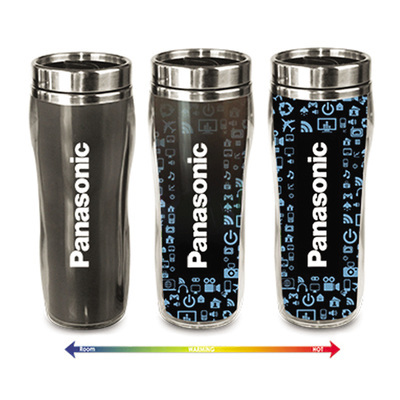 double walled stainless steel tumbler for example. This classy container has stainless steel upper and lower panels with a clear acrylic window in the middle where the sky is the limit. You have the option of using patent paper or a heat insert as well as a 1 color, 1 imprint location on the stainless. The container is BPA free and includes a screw on, spill proof lid. Or how about the 14oz Luxor or Chianti tumblers? The Luxor tumbler is your basic double wall lined tumbler, yet features the spill resistant "S" shape lid. These are available with full color paper, film, glitter, or heat insert. If you have a lot to say or show, this would be the tumbler for you. The Chianti tumbler, on the other hand, has many of the same features as the Luxor, however, the clear acrylic window space is only available on the bottom half. The top half offers a full color imprint on the stainless steel with the bottom showcasing your fully color paper custom design. Let's not forget the 16 oz. tumblers which is the most popular size out of the 3 we suggest. Let's first discuss a class style, the Equinox. This 16oz double walled tumbler comes in both black and white with a pop open spill resistant lid. 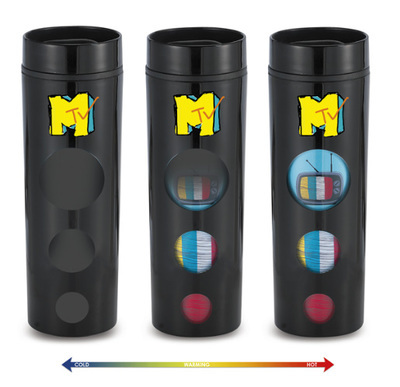 The design offers 3 circular windows for your inserts as well as a 1 color, 1 location imprint on the tumbler itself. This particular product has a custom gift box sleeve available as well. Another product that also has all these same features is the Soleil. A standard heat changing, head turning 16oz tumbler you don't want to miss is the Eclipse Global. This product offers a stainless steel liner and the patented "S" shaped spill resistant lid. 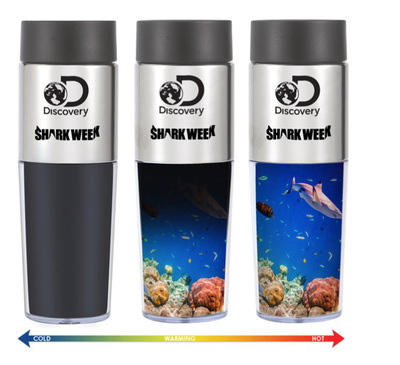 This higher end tumbler also has a 1 color, 1 location imprint with the patented heat changing insert that reveals the world map when filled with hot liquid. These are great for global companies! All of these tumblers are reasonably priced and would be ideal as customer "thank you" gifts, on a gift shop shelf, or even make great corporate company incentive prizes, It really just depends on what design you like the best!